Our first big LEGO review of the year is a good 'un. 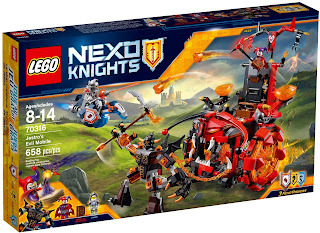 After impressing us with a varied range of sets at this year's Toy Fair, we were keen to see something from the new (and proving to be extremely popular) Nexo Knights line. Thankfully LEGO didn't disappoint us, and a big hulking box of parts dropped onto our doormat soon after. We review Jestro's Evil Mobile (#70316). ... the minifigures. We know we said three, but we'll get to the other next. Here we have Nexo Knight Lance and the dastardly Jestro. Lance is in full battle armour including a new style of helmet visor and a very impressive chest plate (yes, transparent sections on the shoulders!). 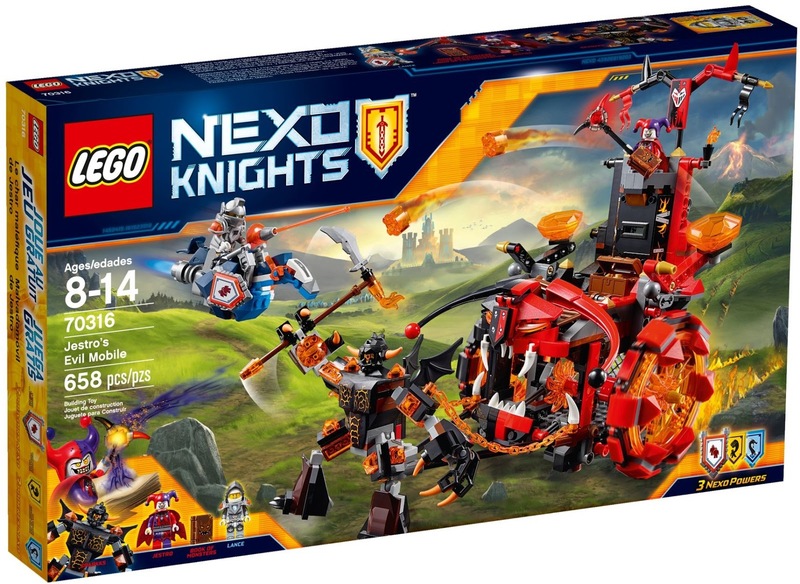 He comes with a lance, obviously, and also a shield with three Nexo Powers. Jestro looks great in his tattered cape, carries a staff with horns, and possesses the highly sough-after Book of Monsters. The book actually opens to reveal a monstrous face, while Lance's Nexo Powers include Cloning, Mightiness, and Sea Dragon; all three of which can be scanned by the accompanying app to access those powers in-game. Completing the trio is this 'big-fig' Sparkks. You actually have to put Sparkks together, a little like the Groot figure in Knowhere Escape Mission, and slightly like the Hulk Buster. However, under that helmet there is an actual minifigure head and all limbs (and fingers - claws, rather) are articulated. He even has cute little wings which are a bit adorable, as well as a bloody great axe with flame detail. You can either hitch Sparkks up to the main Evil Mobile so he can pull it along, or just have him rampaging around on his own. And with any built figure like this, we have to test balance. Sparkks passes with flying evil flame colours. Onto the vehicle itself, and the most striking thing about Jestro's Evil Mobile is that face on the front. A good use of parts has split the whole thing down the middle, with predominately red on the right, and black on the left. As you push (or rather, as Sparkks pulls) the thing along, the lower jaw actually moves in and out in a very sinister way, as if to chomp up any Nexo Knight in its path. And once gobbled up they'll be in here. This little cell has been adorned with the skull of it previous occupant, as well as two fiery blades which turn as the mobile rolls forwards. The back can open up though, so there's hope yet. ...Jestro to keep an eye on those Knights. Jestro's throne/look-out tower actually pivots downwards when things get a tad too hairy for him. Technic joints lower the platform down, hiding it and the nutjob jester behind cover. The coward. There are two flick-fire catapults on the side of the Evil Mobile, loaded with lava bricks. Give them a short sharp push and they will launch quite far. But possibly our favourite parts of the whole vehicle are the wheels. Based on a large Technic wheel, but here in trans orange, they too are colour specific and lock together in a very clever but effective manner. 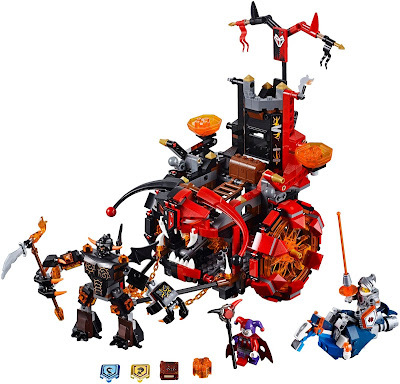 They kind of reminded us of the General Grievous' Wheel Bike set from 2014. Oh, and if you think that's it for this set, you're dead wrong baby. HOVER HORSE! Yes, dear old Lance actually gets a vehicle of his own; a rocket-propelled hovering robot horse. Best sentence ever! We really like this thing, as not only does it look awesome, but it actually looks like a horse as well. Albeit a robot horse from another dimension. Part of the construction uses a backwards-placed dirt bike body, visible above, as well as clips on the side for Lance's lance and shield. Whereas the Evil Mobile itself has the appearance of something haphazard and crazy (although very well thought out) this Hover Horse is a thing beauty and demonstrates just how well those damn LEGO designers know their parts. This is a great set that was both a joy to build and also to play with. There's lots going on here for kids, so it will definitely appeal to the younger crowd, while older collectors will appreciate the parts, the figures, and the how it all looks as an ensemble on your shelf.